At a meeting which in which all the mob bosses of New York are in attendance the Green Goblin has just interupted the Crime-Master's bid to take command of all the gangs in New York. To make matters worse the Goblin has also captured Spider-Man who is unconcious. 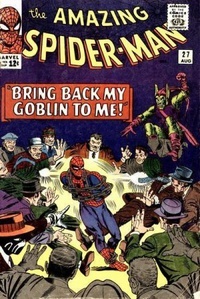 Spider-Man's capture is enough to convince the mob bosses to accept the Goblin as their new leader. The Goblin has Spider-Man chained up but before he can unmask him Spider-Man wakes up and leaps out of the way. Just as Spider-Man escapes the police storm in and begin fighting the crooks. Meanwhile Spidey breaks free of the chains and assists the police who are able to arrest all the criminals. Spidey then goes after both the Goblin and the Crime-Master but the two manage to escape. Spider-Man swings back to Frederick Foswell's apartment still suspecting that he is either the Goblin or the Crime-Master. Foswell isn't there but Spider-Man does find a secret compartment in his closet, perfect for hiding a costume. He then swings to the Daily Bugle where he finds both Foswell and Jameson. Spider-Man accuses Foswell of being a criminal. Meanwhile the Crime-Master is spying on them from a nearby rooftop, seeing it as the perfect opportunity to pick them off. Before he can do so the police arrive and a shootout takes place in which the Crime-Master is shot. Spidey, Foswell and Jameson having heard all the comotion watch the whole thing take place. The Crime-Master dies right before he can reveal the Green Goblin's true identity. Soon after the police thank Foswell for helping them locate the Crime-Master and discovering his identity. Foswell explains that the Crime-Master was really a common mob boss named Nick "Lucky" Lewis. The Crime-Master knew that Foswell was a threat to him so Foswell acted as bait to lure the Crime-Master into a trap. Spider-Man feeling like a fool, apologizes to Foswell and leaves. Remembering that he had set up his camera at the docks Spider-Man goes back for it. After having his photos developed Peter decides to try and sell them to a different newspaper. He sells them to Daily Globe editor Barney Bushkin who asks Peter too many questions for his liking. Meanwhile one of Jameson's fellow club members points out Peter's pictures in the Globe and Jonah worries that Peter might be quitting on him. At home Peter finally sews himself a new costume. Afterwards he realizes that he hasn't spent any time with his Aunt May due to his outings as Spider-Man and invites her to see a movie to which she happily accepts. Back at Foswell's apartment it is revealed that he does indeed have an alternate identity. He is the stool pigeon called Patch, the one who tipped off the police about the gang meeting. Meanwhile the Green Goblin fumes about Spider-Man having ruined his plans and vows revenge.